Starting A Dog Bakery Business? Does the thought of starting a dog bakery business sound appealing to you? If so, you will be getting in on a popular trend. Dog treats are as popular as ever. There are numerous flavors, sizes, shapes, and they range from plain looking to gourmet. There are dog biscuits, dog cakes, chicken jerky treats, all natural dog treats, organic, vegan, dog training treats, and on and on! Dogs always will accept a treat, and pet owners will always be willing to please their pets! If this is an avenue you wish to pursue, the first thing you should do is to research the business. Look around on the internet and take a look at the webpages of similar businesses. Are you planning to work from home? Or, are you adding a dog treat component to an existing business? For example, if you have a dog grooming business or do pet sitting, you could supplement your income by selling dog treats. Your overhead for starting a dog bakery business does not have to be hefty. It is possible at the current time to run your business from your own kitchen. Your product will always be welcome! You can branch out into making dog gift baskets with your treats. Holidays are great times for specialty treats. The availability of more and more dog bakery supplies makes it easier to actually make a variety of treats. 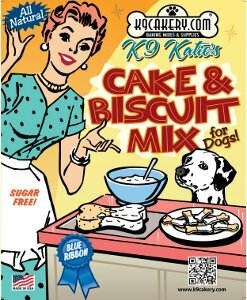 Use pre-made dog cake mixes or dog biscuit mixes and cut down on the time it takes to assemble the ingredients from scratch. If you are planning to work out of your own kitchen, the amount of treats you can make will be limited by the size of your oven. If you are going to work alone, keep in mind that decorating dog treats can be physically demanding. The dog treat industry may soon be regulated closely. The dog food industry is moving in this direction. It may soon be a requirement that calorie counts and other information required on human products be posted on dog edible items. If you are going to make it a real business, it is going to take time and effort! Make sure that you really want to be in business and not just have a hobby. The competition from large established companies is fierce. Dog bakery business information can be obtained by contacting your state feed control department. Q: I am retired and looking for something to do to make a little extra money but not for a full time job to make a living. Right now I make homemade dog treats in my own kitchen for my own dog and for my granddogs. They love them so much they suggested I sell to other dogs! I am only casually selling dog treats and do not have a full time pet bakery business. I depend on word of mouth to my friends and their friends for promotion. Do I still have to follow official regulations and licensing procedures like full-fledged dog bakeries are required to do? A: Thank you for your question. It is our understanding that you will need a license if you are selling as or in a retail establishment. However, you should always check with an attorney or the state feed official for clarification. Pet bakeries are popping up offering wonderful treats for all pets. Many bakers work from home. Many choose to sell their pet treats at farmers markets and other public venues. Some are able to establish a relationship with a local pet store and can sell their treats in the store. These are pet treat businesses and most are licensed and following the state regulations. It is always best to find out the requirements ahead of time. There is a difference between a hobby and a business. An accountant would also be a good resource to consult. The pet bakery business is not as highly regulated as human food businesses...yet. You may want to seek out other pet treat bakers and ask them questions. Many start out by baking for friends and family and then make the leap to going into business. They likely had the same questions as you have. If you have specific questions about starting a dog bakery, we would be happy to help you out. Simply write in your question in the form below. 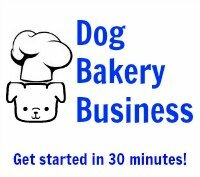 Questions about starting a dog bakery business? Please write your question here. You do not have to use your name or business name. Do I need to have a special license to sell dog treats from my house? Do dog bakeries have to be licensed? I want to start a dog bakery business. Can you help me get started I am not sure what I need to do would like to talk to someone. I'm starting a dog bakery from my home. Where can I get labels for my new business? I don't have a large budget. Making dog treats on a large scale? Is there any place that you can get help in making dog treats on a larger scale than in your home? Business license for home dog bakery?